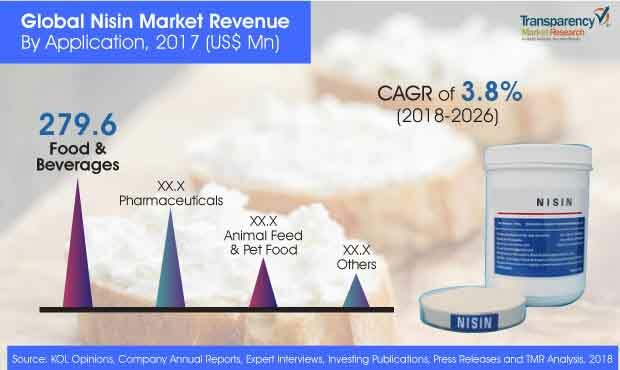 The global nisin market is projected to witness a healthy growth in the coming years, according to analysts at Transparency Market Research (TMR). The market’s business landscape is expected to witness the entry of new players in the coming years, due to high demand for the product. With advances in technology, the production cost of nisin is expected to diminish over time, encouraging new market players. This could be further accentuated by the easy availability of the raw product. Vendors in the global nisin market are expected to focus investing in cost-effective production processes, in order to increase their manufacturing capacities. Players are also seen shifting base to emerging economies such as countries in the Asia Pacific region. China and Japan generate high demand for the product, providing adequate opportunity to established as well new players in the global nisin market. Leading vendors in the global nisin market are Sivelee B.V., Royal DSM N.V., Danisco A/S, Chihon Biotechnology Co., Ltd., and Shandong Freda Biotechnology Co., Ltd. The global nisin market is foretold to exhibit a 4.2% CAGR over the forecast period 2018 to 2026. The market was projected to be worth US$ 309.6 Mn in 2017 and is likely to reach US$ 445.6 Mn by the end of the forecast period. Nisin has been approved for use as a natural microbe conservant by prominent regulatory agencies including the World Health Organization (WHO) and the Food & Agriculture Organization (FAO). In almost 50 countries, Nisin, an important bacteriocin is used commercially as a natural preservative. It is a natural food preservative widely used to increase the shelf-life of processed foods, especially milk products, juice, canned foods and meat. The growth in the worldwide food processes trade has boosted the demand for preservatives, which is a major factor in helping natural preservatives like Nisin to grow. This is a key driver of the global market for nisin. Nisin is also used in the pharmaceutical industry, apart from the food and drinks industry, as a natural preserver and therapeutic because nisin markets should gain traction from the pharmaceutical sector and in the near future stimulate demand in the global nisin market. In recent years, the population's growing health concerns have enriched the propensity for natural conservators to boost nisin demand. Health awareness acts in developing countries as a trend and a driver of growth in developed countries. The health risks ranging from mild headaches to serious conditions such as cancer are known to be caused by synthetic food preservatives such as monosodium glutamate, butylated hydroxyanisole, propyl gallate, sodium nitrate, and butylated hydroxypoluene,. This is a major trend which is expected to increase the demand for natural presevatives such as nisin. Nisin is also a driving force for market growth when used as an antimicrobial agent in active packing. In developed regions such as North America and Europe, there is a rising demand for safe and convenient food. In the recent past, alcohol and alcohol consumption has increased. In developed countries, alcohol is used regularly to support the growth of alcohol-based products and is therefore the driving force for the global nisin market over the forecast period.